During a commencement ceremony at Eton in October 1916, Captain John Gresham (Malcolm McDowell) gives an extremely patriotic speech to eager schoolboys, including Stephen Croft (Peter Firth), the brother of Gresham’s girlfriend. A year later, Gresham is a major and commands a squadron, assisted by the adjutant Captain “Uncle” Sinclair (Christopher Plummer). Gresham has clearly aged, and copes with the responsibilities of command with steady drinking. 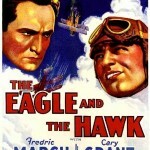 The movie relates a week in the life of Gresham’s squadron, starting with the arrival of Stephen Croft, recently promoted to lieutenant. During that week, Croft takes part in several increasingly hazardous missions, and joins the other pilots as they spend their nights getting drunk. By the end of the week, the squadron has been decimated, and the survivors have to deal with a new batch of earnest, inexperienced replacements. The movie does not have a favorable view of the British military leadership. The pilots complain that GHQ will not let them have parachutes because it fears that pilots will jump out at the earliest opportunity, even though this policy has cost the lives of numerous experienced pilots when their planes caught fire. When Gresham has the opportunity to raise the issue of parachutes, the general in command of the sector states that parachutes might affect the pilots’ nerves, but the general does not actually understand the situation, he just quotes the report provided by his staff. The pilots’ viewpoint is presented when a pilot jumps out of a burning plane, rather than slowly burn to death. Other dangers are presented. On two separate occasions, a pilot has to stand up to reload the machine gun on the top wing, and nearly falls out of the plane. However, the script is fair, and gives the perspective of the senior command. The same general who refused permission to use parachutes decides to send an observation plane to check part of an area for a planned offensive. Aware that it will be dangerous to fly while the area is being bombarded, he admits that the plane might be lost, but it is better to lose two men than a thousand during a failed assault. The film focuses on the pilots, but does not ignore the gruesome wounds suffered by the infantry. One scene shows a small column of blind soldiers led by walking wounded, and a brutal scene in a French field hospital presents the horrible cost paid by the soldiers. Exposed to danger on a daily basis and provided with a well-stocked bar during the evenings, it should not be a surprise that the pilots drink themselves silly every night to forget their fears. At times, the inebriated carousing borders on schoolboy silliness, such as when a celebration with a captured German pilot ends with a pillowfight. When a key member of the squadron is killed, Croft is shocked that the pilots drink as usual, but Gresham explains that is how they cope. It may seem strange, but it is true. The real pilots consumed copious amounts of alcohol to take their minds off the constant fear of death, and any event was seized as an excuse to go on a serious binge. The flashback scenes at Eton capture the patriotism that enabled people to accept the cost of the war. There are recruiting booths and veterans telling war stories to idolizing school boys. The headmaster (John Gielgud) gives a patriotic yet insane speech, stating that what made England great was “Playing the game for the game’s sake,” which he thinks is somehow connected to the Bible and Christianity. There is even a Kitchener Wants You poster in the squadron’s bar. 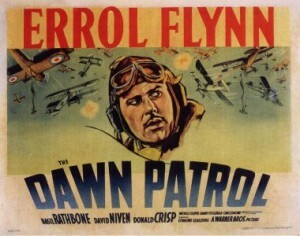 Early in the film, Lieutenant Crawford (Simon Ward), a disillusioned pilot, informs Croft that his life expectancy is only 14 days. With only four hours of experience on fighter planes, Croft can barely take-off or land, so 14 days seems optimistic. Sadly, it was not an exaggeration. Replacement pilots routinely arrived with almost no training, and either died in their first few missions, easy prey for the Germans, or caused the death of experienced pilots, who risked their own lives to keep them alive. The movie is astonishingly accurate but it makes one error. Gresham often complains that he has not received enough reinforcements, but the reason why the squadrons kept getting replacements with such limited experience was the policy of ‘No empty chairs at breakfast,’ which had been introduced by General Hugh Trenchard, commander of the RFC. Believing that empty chairs would remind the pilots of fallen friends, replacement pilots would be sent during the evening to any squadron that had lost pilots that day, so that all of the chairs at the breakfast table would be full the next day, even though the result was an endless stream of replacements who died before the veterans could even learn their names. 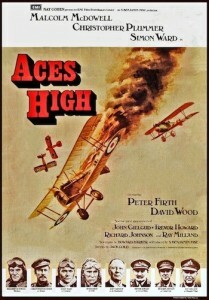 Aces High is based on the play Journey’s End, which was made into a 1930 film of the same name by James Whale. Although the action has been moved from the trenches to the air, it follows roughly the same plot. This is not a cheerful film, and there is not even a romantic sub-plot to alleviate the grimness. Gresham never sees his girlfriend, except during the flashback in the beginning of the movie. 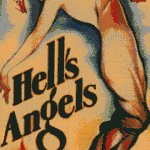 One night, the pilots go to a bar, where they quickly get some girls, who are prostitutes. The shy, inexperienced Croft is set up with one of the women, whose seduction technique is direct and effective. Another night, Croft goes back to town looking for his girl, but learns the hard way that she is a working girl. The portrayal of burnt-out pilots hiding their terror beneath endless carousing is not new but it is all put together brilliantly. 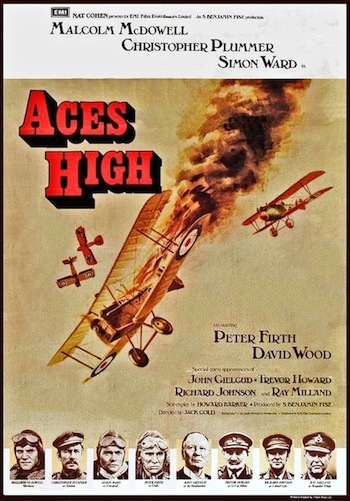 Unlike most WWI aviation films, it is not a fun movie with an undercurrent of tragedy. Even the drinking scenes are sad, desperate attempts to remain sane in a nightmarish world. Excellent review. I had remembered the movie fondly from childhood until I watched it again for a duel review with The Blue Max and found it did not hold up well. It is full of clichés and is poorly acted. The movie does have some excellent non-CGI air combat that make it a must see for that. I do agree that it is accurate in depicting the situation the pilots were in. Thanks. It is too grim to be enjoyable, but its strength is its honesty. I did not think the acting was horrible, but it certainly was not the movie’s strongpoint. Totally agree about the flying scenes, since they were not CGI, must have been scary to film.